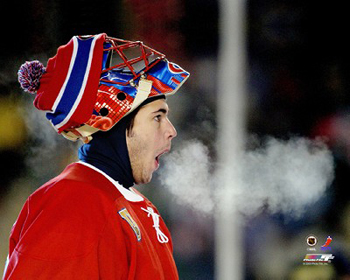 ﻿While this an iconic image of Jose Theodore from the 2004 Heritage Classic, this post is not about that game. Nor is it about the time Jose scored a goal, or his use of Propecia to take care of that sweet, sweet mane of his. This is a post for the hockey fan's dream. Have you ever watched a hockey game, and told yourself or everybody in the room, that if you had the chance, you could have scored on that play. Even if you haven’t said it, you’ve dreamed it. Whether it’s coming in on Ryan Miller and beating him five hole in a snowstorm, or just taking a shot on Vesa Toskala from 197 feet away, certainly we’ve all wanted our chance. 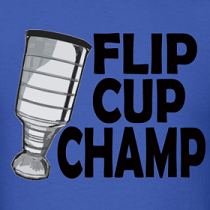 A few years back, one lucky Montreal Canadiens fan got his. - How the hell did this guy get on the ice? - How did he manage to get two shots off? "I didn't really know what was going on until the guy came on. He came at me with his head down so I just wanted to say 'Welcome to the big boys.' I poke-checked him to say, 'You have to keep your head up.' When he came back, I thought about going out of the net and not playing into his game, but then I thought he had the (courage) to go on the ice, so I let him have a free shot at me" - Jose Theodore on the fan at practice. - Loving that the guy always has two hands on his stick, and that the his reasoning for not scoring was, "I didn't have time." - What would I do if I had a chance like that? I probably wouldn't have had my head down and gotten poke checked like Raphael did, and I most definitely wouldn't have shot it right at his pads. So the question is, who would you want to go one on one against and what would your move be? I would want to go against the best, maybe Brodeur... come in fast, use my shot and let it fly glove side... really make him try.